On September 13th, Pandora, the largest streaming music provider in the U.S., will host a live celebration with top pop music talent in the heart of Los Angeles. 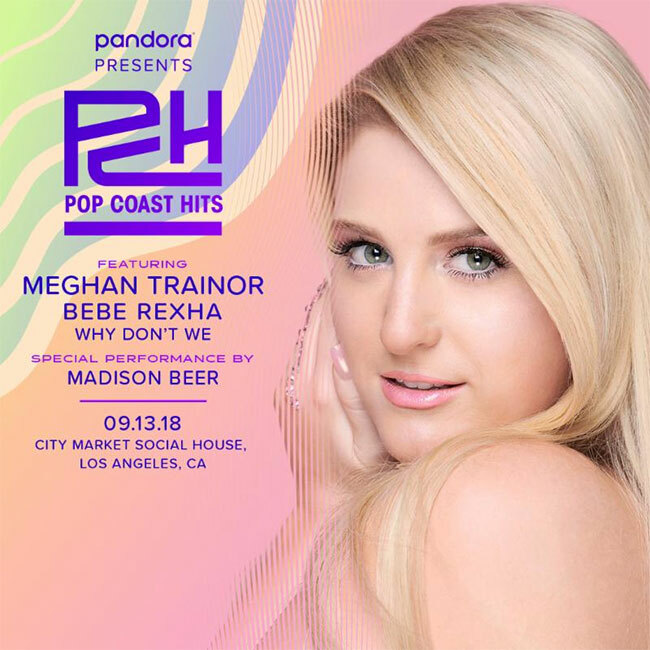 Pandora Presents: Pop Coast Hits will feature performances by GRAMMY award winner Meghan Trainor, record-breaking singer-songwriter Bebe Rexha, breakout group Why Don’t We, and a special performance by Madison Beer. Fans can RSVP now for free event admission at City Market Social House. In conjunction with partners Gillette Venus, Halo Top, Kidde, Pine-Sol, SmileDirectClub, Spectrum, and wet n wild, Pandora is creating an interactive experience for event attendees including custom activations and exciting giveaways to complement the performances by the lineup of extraordinary talent.